NEWS: Letter from Working Group members sent to the State Department of Natural Resources, Department of Environmental Conservation, and US Environmental Protection Agency highlighting our concerns for mercury. Click here for the original letter from NAEC, and here for DEC's response to it. Mercury is a dangerous neurotoxin that accumulates within the food chain of animals, and eventually humans. Children and pregnant women are especially vulnerable to mercury that is inhaled or consumed. At high rates, mercury can cause many health problems, the most severe of which include birth defects and brain damage. More health problems are listed here. The rock at Donlin Creek contains very high levels of mercury compared to other mines, but it is "locked up" in the rocks. It is not dangerous to touch or breathe when it is part of rocks, but when it is finely ground up and heated, it vaporizes. Through heating during the milling process, some mercury would be released into the air. Some of it would also end up in the tailings ponds (example photo here), and although mercury in the tailings pond poses major concerns and must be dealt with later, the immediate concern is mercury that ends up in the air and eventually back into the environment to be eaten by fish and ultimately, people. Vaporized mercury can drift with air currents outside the processing plant to precipitate later back to the ground, and it can travel a long distance. The consumption of fish is by far the most significant source of ingestion-related mercury exposure in humans and animals. Donlin Creek is of particular concern because people in the region rely on wild fish for an estimated 60% of their diet. Furthermore, workers at a mill would likely be exposed to mercury in the air, making mine employees far more susceptible to mercury contamination than others in the region. A compelling case study in a gold mining region in Brazil documents strikingly similar dynamics as those that could be seen at Donlin if high levels of fugitive mercury are emitted into the air or groundwater. Some mercury can be captured -- taken out of the air and made into a liquid that can be stored -- but some cannot be captured. Mercury that comes from mill processes that are done within vats or tanks can be captured before it goes through a smokestack-type pipe into the air, and this is called a "point-source." But some escapes into the air from other mining processes and is not collected -- these are considered "fugitive" emissions. Mercury that goes into tailings ponds is not captured and sometimes it gives off gases over time that contain mercury. This is called "off-gassing" -- a fugitive source. Waste rock piles also give off some mercury, but at relatively low levels, as does ore in trucks and on conveyor belts. Between all these fugitive sources, it can be difficult to calculate exactly how much mercury is going into the environment and exactly where it is coming from, which is why it is very important to have baseline studies completed before a mine is built so that people know previous levels and can determine later through ongoing monitoring studies how much has changed and if the environment is becoming too polluted. We can calculate the amount of mercury that will go through the processing plant -- mercury that will either end up in the air or in the tailings pond. Donlin Creek LLC has said that there are 1 – 2 milligrams of mercury in every kilogram of rock. They also estimate that 59,000 tons of rock will be processed every day, or about 21.5 million tons per year. Based on this, 20-40 tons of mercury will go through the processing plant every year. We don't yet know exactly how much would go into smokestacks within the mill and how much would go back into the tailings ponds, but we believe that the majority will end up in the tailings pond. Fortunately, the US Environmental Protection Agency has created a rule that limits the amount of mercury that can come from point sources (click here to read a News-Miner article about it). We've posted the final rule here (Donlin referenced on p. 84). This will greatly reduce pollution at Donlin Creek, but the mine will still emit mercury anyway both during operation and after closure. The new EPA rule allows for 84 pounds of mercury to be released into the air per one million tons of ore. In this case, that will mean that Donlin Creek will legally be able to release about 1800 pounds of mercury into the air per year from point sources, and anything more than that will need to be collected using "capture" equipment that takes it out of the air and causes it to liquefy. The liquid mercury will be stored in flasks or drums and will need to be shipped away. There are very few companies that buy mercury, but some do because we use mercury in fluorescent light bulbs, electrical switches, and other equipment. However, Donlin could produce so much "by-product" mercury that there won't be enough people to buy it all. We believe Donlin LLC should be very clear about how it plans to safely store the mercury until getting rid of it, how it plans to ship it off site, and who will buy it. They should be required to provide shipping logs and names of final destinations to anyone who requests the information. We still have a lot to learn about mercury at Donlin Creek. Because between 20-40 tons of mercury will be entering the mill and the new EPA rule only allows 1800 pounds to be emitted into the air every year, many tons will either be collected or go into the tailings pond. Potentially, over the life of the mine, hundreds of tons of mercury will end up in tailings. Although it can be captured later, it is extremely expensive and difficult. We believe the lack of a long term protocol for dealing with mercury in the tailings could be a problem, and must be studied as part of a larger mercury risk assessment. Did you know that simply draining the water from the tailings pond after mine closure is anticipated to take 43 years and it will still have immense amounts of sludge in it during the year 2087? After that, there will still be a huge expanse of tailings materials and Donlin has not proposed any way to ever deal with it, and it remains unknown how much mercury might enter the environment from the draining process. This page is a good reference for understanding why some mines have permanent impacts, and why toxic mitigation for them is so essential. 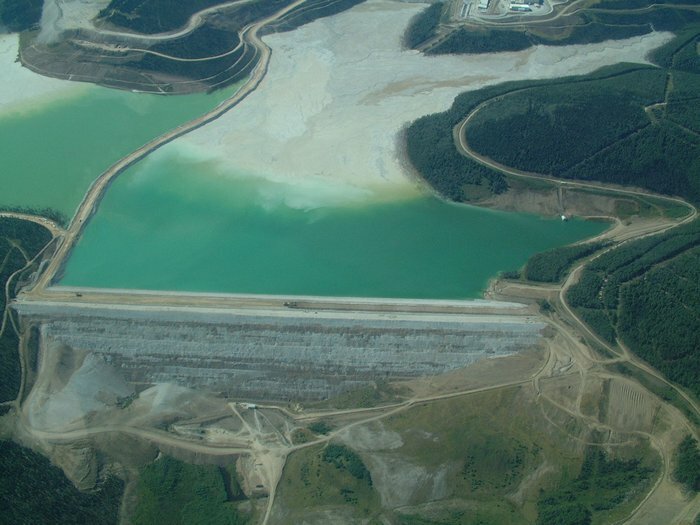 This page is a compelling look at dozens of examples of tailings dams that have failed, with major environmental consequences. -- Will Donlin LLC conduct a mercury risk assessment as we believe is necessary? -- What are the current levels of mercury in fish, plants, and soil in tributaries to Crooked Creek, Crooked Creek, and the Kuskokwim? How does this compare to the EPA's "safe" levels? -- Will anyone regularly monitor the mercury in soil, plants, and fish to see if it increases during mining operations? -- Exactly how much mercury will end up in the tailings? Does Donlin LLC have a plan to deal with this? -- What will Donlin LLC do with the captured mercury? Will they try to keep it at the mine forever if it is too expensive to ship offsite and store? -- How will people know if they are being exposed to mercury in the workplace or through their diets? You can also visit the mine design page to learn more about tailings ponds and how this mine will be built. To learn more about the permanent impacts of mining, visit the post-reclamation issues page or see this page from Ground Truth Trekking. Again, we encourage you to leave a comment below.